Summary: Epidermal nevus syndrome is a kind of neurocutaneous syndrome that is associated with epidermal nevus and a variety of congenital CNS disorders. Clinical presentations include seizures, paresis, mental retardation, and developmental delay. We report three cases with MR imaging and magnetoencephalography findings; one patient underwent ictal and interictal single photon emission CT. Both structural and functional imaging studies indicated that the frontal lobes had lesser involvement or were intact. One patient underwent hemispherectomy because of the medically intractable seizure. He remained seizure free with topiramate monotherapy. Epidermal nevus syndrome is a rare neurocutaneous syndrome consisting of epidermal nevi and a variety of congenital defects that affect the CNS, connective tissue, and ocular, skeletal, cardiac, genitourinary, and even endocrine systems (1–4). In addition to unilateral hemimegalencephaly, which is the most commonly found CNS abnormality, other neuronal migration abnormalities (patchy macrogyria, microgyria, heterotopia, etc. ), vascular malformations, agenesis of the corpus callosum, Dandy-Walker syndrome, myelomeningocele, Arnold-Chiari malformation, and tumors have been reported (2, 5–7). An intractable seizure disorder is the most prevalent clinical presentation. MR imaging plays an important role in delineating these CNS structural abnormalities. Other functional neuroimaging techniques, such as magnetoencephalography and single-photon emission CT (SPECT) may help identify the epileptogenic foci and cortical regions important for sensory, linguistic, and other cognitive functions (8, 9). To improve the understanding of neuroimaging findings associated with epidermal nevus syndrome, we herein report the neuroimaging profiles of three consecutive patients. This 13-month-old male patient presented with left face epidermal nevus and right hemiparesis complicated with complex partial seizure onset. He was a product of a full-term, uneventful pregnancy. A caesarean section was required because of failure to progress to natural labor. He experienced seizure onset during the first 24 hr after birth. A physical examination showed facial hypertrophy and left eye glaucoma. MR imaging (Fig 1A) showed left hemimegalencephaly (including the cerebrum and cerebellum) ipsilateral to the epidermal nevus, distorted and enlarged lateral ventricle, gyral fusion, and prolonged T1 and T2 signal intensity in the white matter. Calcification and focal heterotopia were also found in the left hemisphere. The gray-white matter junction was indiscernible in some regions. The midline structures were shifted to the right, and left hippocampus was poorly developed. Increased signal intensities in the white matter were found in frontal, temporal, parietal, and occipital lobes and even in the left part of the corpus callosum. The left frontal lobe was less affected compared with other lobes. The contralateral hemisphere was normal. Ictal SPECT (Fig 1B) showed increased perfusion in the left central and temporal areas, whereas interictal SPECT (Fig 1C) showed increased occipital activity in the right hemisphere and overall reduced activity in the affected left hemisphere. The left occipital lobe showed decreased tracer accumulation both ictally and interictally. Magnetoencephalography (Magnes WH2500; 4D Neuroimaging, San Diego, CA) showed interictal frequent epileptiform events originating from a large region along the lateral ventricle (heterotopia area), frontal-central, and temporal areas of the affected hemisphere (Fig 1A). After trials of phenobarbital, adrenocorticotropic hormone, topiramate, and vigabatrin, seizure control was still unsatisfactory and the decision was made to proceed with a functional hemispherectomy. Histology of the removed tissue confirmed the MR imaging findings: gyral fusion, heterotopia and calcification, and loss of cortical lamination. Neuronal loss and gliosis were also found in temporal, frontoparietal, and hippocampal regions. The patient remained seizure free after 1 year of follow-up while receiving topiramate monotherapy. 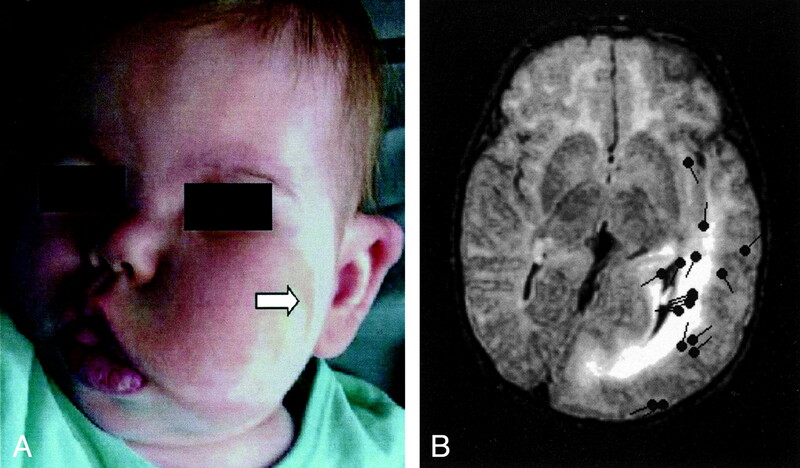 Images from the case of patient 1, a 13-month-old male patient who presented with left face epidermal nevus and right hemiparesis complicated with complex partial seizures. A, FLAIR image shows left hemimegalencephaly associated with ipsilateral enlarged ventricle, dysmyelination, and thickened and flattened cortex. Open left insula, blurred white-gray matter junction, and heterotopias (arrows) can be seen. Sources of interictal spikes (black spots) are scattered over central parietal region and deep around the heterotopia region of the left hemisphere. B, Ictal SPECT scan shows increased perfusion in the left parietal (curved arrow) and temporal lobes. C, Interictal SPECT scan of corresponding area shows decreased activity (curved arrow). This 26-month-old female patient presented with left facial epidermal nevus and facial and neck hypertrophy (Fig 2A). The patient had experienced complex partial seizures since 1 month of age. Skin biopsy confirmed the diagnosis of epidermal nevus and hypertrophy. MR imaging showed left hemimegalencephaly, a distorted and enlarged lateral ventricle, and prolonged T1 and T2 signal intensity in the white matter of parietal, temporal, and occipital lobes, largely sparing the frontal lobe (Fig 2B). 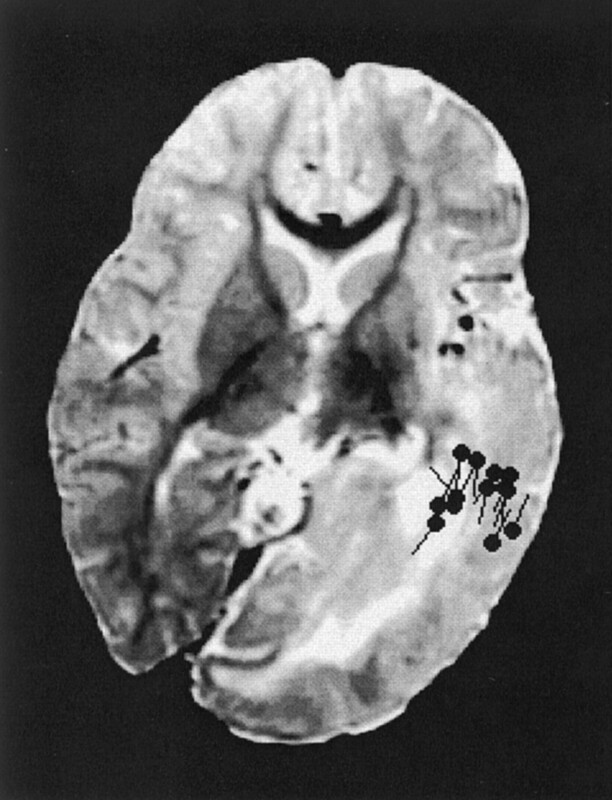 Magnetoencephalography showed frequent interictal epileptiform discharges originating from the posterior part of the left hemisphere. The patient responded well to pharmaceutical treatment for her seizures. Her seizures were well controlled medically as of the time of this writing. Images from the case of patient 2, a 26-month-old female patient who presented with left facial epidermal nevus and facial and neck hypertrophy. A, Photograph shows left facial hypertrophy and epidermal nevus (arrow). B, FLAIR image shows the left hemimegalencephaly, enlarged lateral ventricle, dysmyelinated white matter, blurred white-gray matter junction, and plate-like thickened cortex in the temporal, parietal, and occipital lobes. The left frontal lobe and right hemisphere are normal. Sources of interictal spikes (black spots) are scattered around the posterior part of the left hemisphere. This 8-month-old female patient presented with left epidermal nevus, seizures, and right hemiparesis. She was a product of a full-term, uneventful pregnancy. She had experienced seizure onset on the third day postpartum. Biopsy from forehead confirmed the epidermal nevus pathology. The MR imaging study showed changes similar to those shown for Patient 2 (Fig 3). Both frontal lobes were normal. A magnetoencephalography study suggested that the origin of interictal epileptiform discharges were located at the temporal parietal region of left hemisphere. The patient’s seizures remained under control medically as of the time of this writing. Axial view T2-weighted image of patient 3 shows left hemimegalencephaly sparing the frontal lobe, with appearances similar to those on the images of patient 2. Interictal epileptic sharp waves or spikes (black spots) are localized in temporal and parietal areas. Epidermal nevus syndrome receives its name from the strong association between skin lesions and CNS abnormalities (1–7, 10, 11). Among CNS abnormalities, unilateral hemimegalencephaly is the most striking finding and is typically ipsilateral to the skin lesions. Skin lesions are distinctive and are usually found on the scalp, face, or neck. The most common clinical neurologic symptom is seizure disorder, which was present in 16 of 17 cases in the largest reported series (2) and in all of our patients. MR imaging is the preferred structural imaging facility for epidermal nevus syndrome because of its high tissue contrast. The most common findings are unilateral hemimegalencephaly, ventricular enlargement, and increased signal intensity in white matter of the affected hemisphere on T2-weighted images (1–7, 10, 11). These findings were present in all our cases. Another MR imaging finding for our patients was the loss of delineation between white and gray matter. Lack of horizontal layering may be indicative of underlying histologic abnormalities in this finding. The affected left frontal lobe was well sulcated and well gyrated on MR images compared with the other lobes in patient 1, which was the most severe case. Frontal lobes of the affected hemisphere appear normal on the MR images of patients 2 and 3. In accordance with the structural findings, no apparent difference of tracer accumulation was observed between the intact and affected frontal lobes on ictal and interictal SPECT scans (Fig 1B and C). Magnetoencephalography is used to measure electromagnetic signals associated with epileptiform events (spikes, sharp waves, or slow waves). In conjunction with MR imaging, localization of intracranial electromagnetic sources can be computed. The three patients whose cases are presented herein showed multiple foci of interictal epileptiform discharges distributed within the affected hemisphere (Figs 1A, 2B, and 3). Most of these events originated from cortical areas that bore structural abnormalities. No epileptiform discharges of occipital origin were present in patient 1. Severe neuronal pathologic abnormality may have reduced this region to being incapable of producing synchronous neurophysiological activity. Some epileptiform events, however, originated from heterotopia along the lateral ventricle of patient 1. This finding confirmed the intrinsic epileptogenic nature of heterotopia (12). The interictal decreased tracer accumulation in the cortex of the affected hemisphere on SPECT scans is thought to result from the high concentration of abnormal and the reduced number of normal neurons. The increased ictal tracer accumulation in the cortex of the affected hemisphere was likely caused by the seizure activity originating in the damaged hemisphere (Fig 1C). All the neuroimaging findings (including MR imaging, magnetoencephalography, and SPECT) and scalp and cortical EEG supported the concept that the epileptogenic foci were multiple and covered a wide area in the affected hemisphere in patient 1. The intractable seizures and scattered epileptic foci both contributed to the decision to proceed with a functional hemisphectomy. In conclusion, multiple neuroimaging modalities (anatomic and functional) play an important role in evaluating the extent of the CNS involvement in this neurocutaneous syndrome. MR imaging reveals the structural details. Magnetoencephalography and SPECT can provide important functional information and can show the extent of the epileptogenic locations, especially for the surgical candidates. Hemimegalencephaly in patients with epidermal nevus syndrome may relatively preserve frontal lobes. This work was partly supported by National Institutes of Health grant R01 NS37941 (to A.C.P.). Accepted after revision December 17, 2002.